Flavorful Family Adventures in Sulphur, Louisiana: Get Down to Yummy Town! One thing is for certain, kids who are from Southwest Louisiana will not rest until they get their fill of crawfish during crawfish season. They smell it wherever they go. I swear they develop a 6th sense and get downright psychic about crawfish boils. They see their friends posting about it (yes, Louisiana kids post food), and you are #Meh as a parent if you don’t take them to taste that “red gold” at least once. So, over spring break, I decided to be a #NotMehMom and take the kids out for crawfish. But, what I didn’t bargain for was a priceless, memorable experience – beyond crawfish! The adventure started at Hollier’s on Ruth St. Everyone was waiting with Christmas morning excitement, making Instagram stories and SnapChat videos. Of course, everyone looks better with a virtual flower crown while anticipating crawfish! Playing with phones abruptly came to an end whenever the crawfish platters were delivered with seasonings steaming up to the ceiling. (Mmmmm…so good). 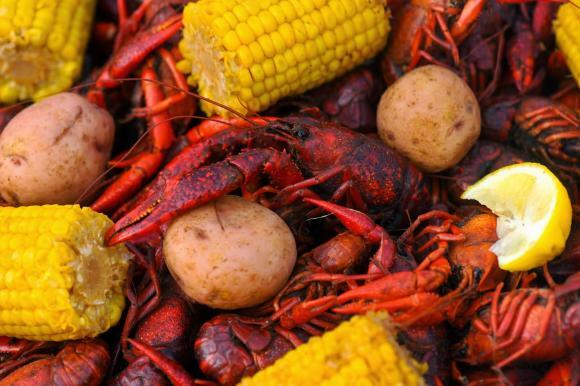 Eating crawfish is a messy affair, but that’s half the fun. One of the things you “have” to do is pose on The Big Hollier’s Chair outside once you have eaten their delicious seafood. Maybe the chair is that large so that no matter how much you eat, you still feel petit? The spices caused everyone to look like they just applied fresh, orange lipstick, so needless to say, after the “big chair” picture, it was like a refreshing oasis to see Gumbeaux’s Sneaux across the street, dancing like a mirage. We quickly made our way to the snow cone stand. Flavors like s’mores, mudslide, red velvet cake sparked our imaginations. The “sneaux” was a perfect complement to the seasonings that we had at lunch. Stuffed as we were, we decided to take a walk at The Grove on the grounds of the Henning Cultural Center. The winding paths, fountains, trees, and flowers were peaceful, and there is even a little make-shift mini library for park lovers who also are in the mood to chill and read. Being with my 6 kids, that was not an option! So close to culture, we decided to check out the exhibit at the Henning Cultural Center. The center is a turn of the 20th Century home that was converted into an art gallery. Right next door is the Brimstone Museum and other artifacts. 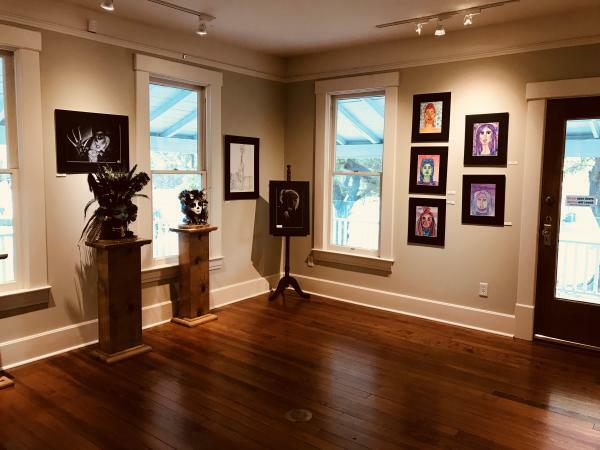 The gallery always has new and colorful exhibits, and it is a delight to walk through the gallery with the thick, old glass windows and the wrap around porches adding to the mystique and charm of cultural experience. Okay, so who’s up for coffee? 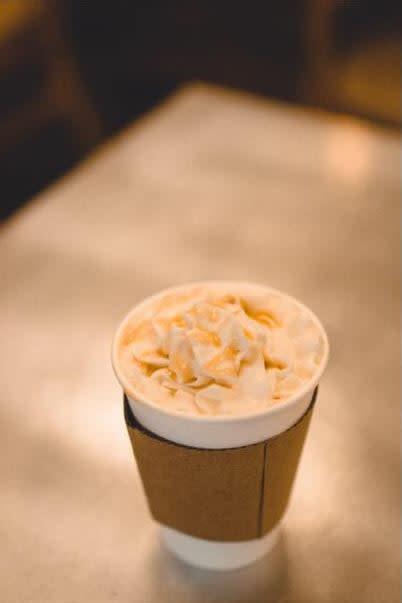 With the spices and the sugar rush, you know you have to top off that with caffeine! One of the newest businesses in Sulphur is Soleil Café or "Café of the Sun." Hands-down, I had one of the tastiest Chai Lattes that I have ever had. They also serve up pastries and plate lunches in addition to java on the run. The café area was quiet and peaceful, and my daughter discovered that the bathroom smelled like freshly baked bread. (Everyone had to go and see for themselves). Bonus points to Soleil Café! What a flavorful and cultural experience – all within a few yummy blocks!